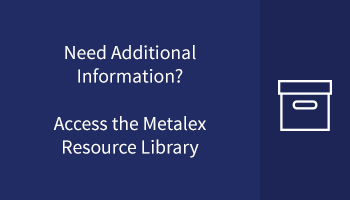 Metalex is proud to present our Resource Library. Since our founding in 1962, we have provided metal stamping solutions to clients across such diverse industries as automotive, railroad, and architecture, among many others. As a result, we have been involved in almost every aspect of the manufacturing and mechanical assembly process for decades. Our experience and expertise allows us to offer our clients assistance with a range of processes and challenges to meet project specifications in a timely and cost-effective manner. The Metalex Resource Library brings together our decades of experience and draws on our first-hand industry knowledge and presents it in a large collection of guides and documents. They are meant to help our clients choose the correct products for their projects, properly install and operate them, and to help get the longest life out of their equipment. Available in our Resource Library are a number of our brochures such as the Metalex Company Brochure and the Morton Industrial Brochure. In the Metalex brochure, you see what we offer that sets us apart and ahead of the curve. The brochure also includes general technical data to help you make the most informed decision when purchasing. The Metalex Resource Library also has a variety of other helpful guides like the Morton Rail Products Running Board Worksheets¸ the Morton Running Board Brochure, and the Morton Industrial Flyer. These are all designed to help you inspect, compare, and install our products to allow safety, maneuverability, and efficiency throughout your facilities. Our dedication to customer service—our ISO 9001:2008 registration is also available for free download—means that we will work with you to help you achieve the results you are looking for. Visit our Resource Library today, and if you have any questions, please feel free to contact a representative to find out how we can help you meet all your project requirements.